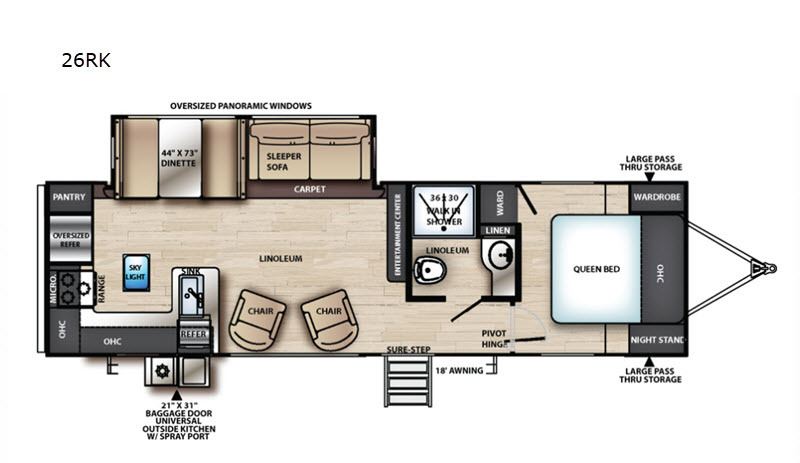 Step inside this spacious travel trailer for a weekend trip the whole family will remember. You will love the front private bedroom with a queen bed, a nightstand, and wardrobe. This unit features a large slide out, so open it up, kick back on the lounge chairs, and enjoy the added interior space. After a long day out exploring the woods, the kids will love to sleep on the sleeper sofa, or on the 44" x 73" dinette. The chef will appreciate the rear kitchen that features a skylight, a pantry for dry goods, and plenty of counter space for meal prep. Are you ready to pack a whole lot of fun in a great travel trailer? Well, come choose a Forest River Vibe! You'll love the extra-large aluminum-framed pass through storage for all your outdoor gear, plus there is an outside shower, and an LED awning light. On the inside of each model you will find solid surface counter tops, an extra large pots & pans drawer, a 12 volt Everchill residential refrigerator, and a comfy Denver pillowtop mattress to make you feel right at home. 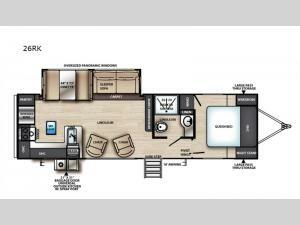 Each unit has been constructed with vacuum bonded "Aluma Frame" sidewalls, a 2" laminated floor, and a new 3/4 front fiberglass cap with an LED light, so you can enjoy your travel trailer for years to come! Shower Size 36" x 30"
Shady Maple RV is not responsible for any misprints, typos, or errors found in our website pages. Any price listed excludes sales tax, registration tags, and delivery fees. Manufacturer pictures, specifications, and features may be used in place of actual units on our lot. Please contact us @717-351-0087 for availability as our inventory changes rapidly. All calculated payments are an estimate only and do not constitute a commitment that financing or a specific interest rate or term is available.